Check out my latest cooking episode up on GoodBite.com, part of the new Easy Entertaining series which has tips for making holiday entertaining tasty and easy. This time I’m sharing our recipe for roast pork tenderloins with maple pomegranate glaze, a flavorful dish that you can have ready in about 30 minutes. The pork comes out tender and juicy and is always a hit with the family, even our young boys ask for seconds. Serve it with roasted potatoes and brown butter green beans, and you’ll have a delicious meal. 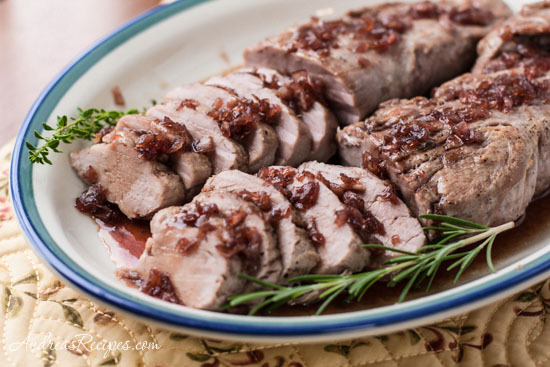 A roasted pork tenderloin is easy to make and adding a flavorful glaze makes it a beautiful dish to serve your guests. And you won’t need to spend a lot of time in the kitchen because you can roast the tenderloins and make the glaze all in about 30 minutes. Maple syrup comes in a range of grades based on color and translucency. I like to use Grade B—the darkest maple syrup—for cooking because the flavor is more robust. Grade A Dark Amber will also work in this recipe. Because you’ll have two tenderloins in the skillet, make sure the pan is large enough to hold them both, but if not, you can brown them one at a time. You want to have some nice brown bits in the bottom of the pan for the extra flavor, so try to avoid nonstick skillets. 1. Preheat the oven to 450° F/230° C.
2. Rub the tenderloins with the salt and pepper. Warm the oil in the large skillet until very hot, almost smoking. Add the oil to the pan and brown the tenderloins on both sides, about 10 minutes total, then transfer to the prepared roasting pan. 3. Insert a meat thermometer into the thickest part of one of the tenderloins and bake in the oven until the temperature reaches 135°/57° C, about 15 minutes. Rotate the pan about halfway through roasting. 4. While the pork is in the oven, sauté the shallots in the pan drippings over medium heat until they soften. Add the sprigs of rosemary and lemon thyme and continue cooking until the shallots just start to brown. Add the pomegranate juice and scrape the bottom of the pan to loosen the caramelized bits of fond and bring to a slow boil. Remove the herb sprigs and add the maple syrup. Bring back to a slow boil over medium heat and continue cooking until the glaze reduces and thickens, about 10 to 15 minutes. Watch carefully because the sugar in the maple syrup can burn. 5. Remove the pan from the oven and place it on a cutting board or other heat resistant surface. Cover the pork with foil and let it rest until the temperature reaches 145° to 150° F/63° to 66° C, about 5 to 10 minutes. Slice into 1/2-inch thick pieces and serve with the glaze. Una manera sencilla y deliciosa de preparar el solomillo de cerdo.